This newest type Depstech wifi endoscope has surpassed the traditional endoscope's using limitation for iPhone user. This newest type Depstech wifi endoscope has surpassed the traditional endoscope's using limitation for iPhone user. It can work perfectly with Android 2.3+ and IOS 6.0+ smartphone and will be the best inspection tool for iPhone user. Besides, our endoscope can support more than one devices to be connected simultaneously to view the live inspection photos or videos. Working Temperature: -20 - 80℃. 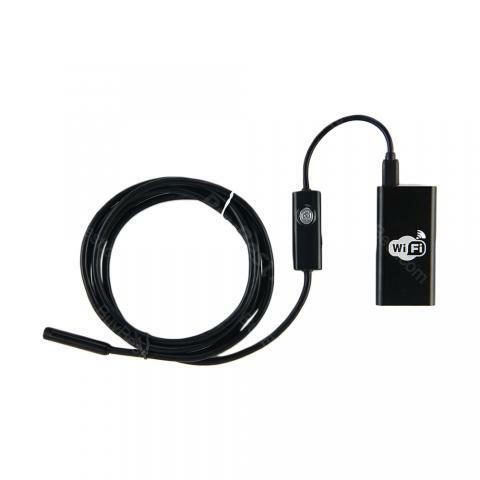 • The Newest Type Endoscope: Unlike other endoscope cameras on the marketplace, this wireless wifi endoscope camera not only work with the Android smartphone(Above Android 2.3) but also iPhone IOS system(Above IOS 6.0). This is perfect for iPhone user who wants do inspection work. Without using extra adapter or cable, it can be easily connected to your smartphone via WIFI. The only thing you need to do is to contact it to your device via Bluetooth. • Unique white LED technology, 6 adjustable LED light on camera tip, it greatly helps to improve image brightness and clarity even in dark or low-light condition. Moreover, 2 Megapixels HD camera offers you a wonderful experience of recording a clear close range HD video in AVI format and snapshot image in JPG format with two adjustable resolutions 640x480, 1280 x 720. • Featuring 2m cable, waterproof and 9mm diameter camera, this endoscope is suitable for various types of environment, for example, low-light or dark area, damp or wet area etc. Furthermore, armed with bendable semi-rigid cable which can bend and hold it's shape to access a wide variety of confined place. • Premium Camera Chip: Adopting the second generation chip at 30fps, which is best for acquiring the smoothest video and image, and this is a great advantage over the other products at 10fps on the marketplace. • Quick link： H5 Mini Wifi Camera. The length of 2 meters is enough for me. The camera works amazingly great. The small camera arrived safely and quickly from China. Nice site for small devices. Cheaper than in my local shops. The endoscope camera works great! Recommend this camera! Cheap and amazing. Thanks for the professional customer services. They response really fast in minutes. Perhaps because the site doesn't need to serve many customers. But hope you can grow bigger and bigger.